The article “3D computer simulation of ground thaw bulb formations including ice wedges around the pipeline” was published in the industry-specific journal ”Pipeline transportation: theory and practice” (# 6 (40) 2013). The main threat to the integrity of the underground pipeline is the ground settling under it, caused by the thawing of ice wedges. In the article, ground freezing and thawing with ice wedges around various pipeline intersections are numerically simulated with Frost 3D Universal software. The obtained results provide crucial data for the feasibility analysis of the pipeline construction, the pipeline route plan and subsequent evaluation of potential problems during operation. Download the preview (in Russian) of this issue of the journal on the publisher’s website here. 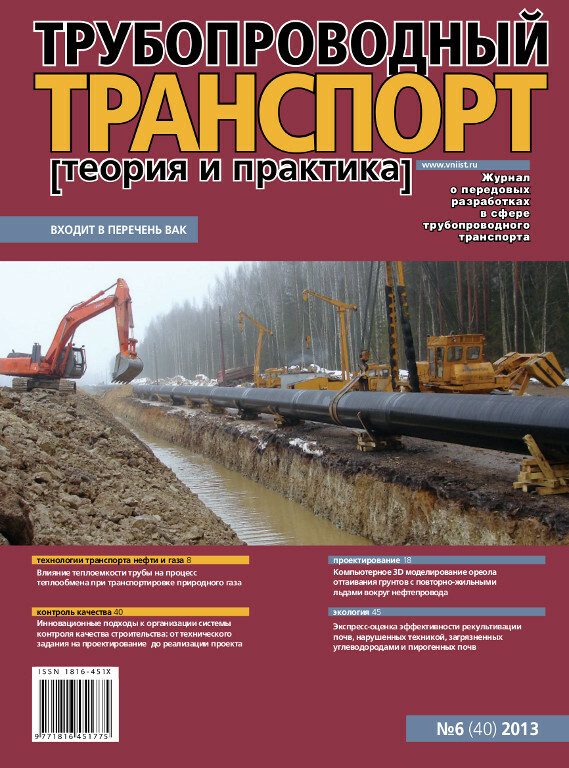 About the journal: ”Pipeline transportation: theory and practice” is a respected journal which covers all aspects of the construction and operation of pipeline systems: design, construction, maintenance, test operations, etc. This journal is listed in the catalogue of scientific journals of the Supreme Attestation Commission of the Ministry of Education and Science of the Russian Federation. Forecasting of Permafrost Thawing Around an Underground Cross-Country Pipeline About Simmakers Ltd.